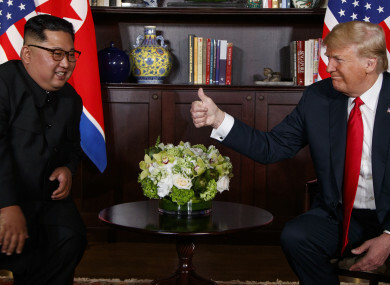 Donald Trump meets North Korean leader Kim Jong Un in Singapore in June 2018. US PRESIDENT DONALD Trump believes North Korea has an “awesome” future if it agrees to give up its nuclear arsenal during a much-anticipated summit in Vietnam. Trump made the claim ahead of a meeting with North Korean leader Kim Jong Un in the Vietnamese capital Hanoi, as the pair look to build on their historic first meeting last June. Trump, who has spoken of the “love” between himself and Kim, predicted that giving up nuclear weapons could see North Korea emulate the development of Vietnam. It followed comments the US President made to his Vietnamese counterpart, Nguyen Phu Trong, that construction he’d seen as he drove to his Hanoi hotel showed that the country was “an example of what can happen”. “The potential is awesome, a great opportunity, like no other in history,” Trump tweeted ahead of his second meeting with Kim today. In another tweet, he said that members of the Democratic Party should “stop talking about what I should do with North Korea and ask themselves instead why they didn’t do it’”. There has been speculation that this week’s summit could see an end to the conflict between North Korea and the US, which started at the end of the Korean War in 1953. Some analysts fear the symbolic gesture would have consequences and upset the political balance in a region where the US and China are struggling for influence. Pressure has also mounted on Trump to deliver more concrete results and follow-up on agreements made at last year’s summit in Singapore. That meeting ended with a vague statement promising to work “towards complete denuclearisation of the Korean peninsula”. But both countries have disagreed on what denuclearisation means. Although North Korea has gone more than a year without conducting missile and nuclear tests, it has done nothing to roll back the arsenal it has already built. Washington would ideally like Kim to dismantle a key nuclear facility at Yongbyon, allow international inspectors into the country, and even see a list of all North Korean nuclear assets handed over – something the country has refused to do. In return, Trump is believed to be considering to ease tough international sanctions, while opening diplomatic liaison offices is another possible concession. Trump and Kim are expected to hold a 10-minute meeting today, before a 20-minute session without aides, followed by a 90-minute dinner. They are due to meet again tomorrow, although no details have been released, adding to the impression that much of the summit is being decided at the last minute. Email “'The potential is awesome': Donald Trump set to meet North Korean leader Kim Jong Un in Vietnam”. Feedback on “'The potential is awesome': Donald Trump set to meet North Korean leader Kim Jong Un in Vietnam”.